Activision’s putting more than just faith in bungie’s Destiny. Though it’s the developer’s first game since freeing itself from the constraints of doing nothing but Halo, Activision’s also putting a whole lot of money in to the game There are many who doubt the game’s going to live up to it’s increasing hype – but Sony’s not among them. They believe that Destiny is going to be a system seller on the PlayStation 4. They showcased the game at their E3 conference with a lengthy trailer. Now, thanks to the magic of the internet and YouTube you get to watch an extended version of that trailer, that includes a dash of developer commentary, and fills you in a little more on the game’s world. Maybe it’ll convince a few more of the naysayers. The game’s currently in closed alpha. We’re busy in that alpha, and will bring you our impressions once we’re done shooting things in bungie’s “shared world” shooter. Bungie still refuses to use the word “MMO,” because it’s part of an off-putting bit of nomenclature, but that’s essentially what it is. There’s a public beta that kicks off next month, for those of you who haven’t managed to get in to the alpha. 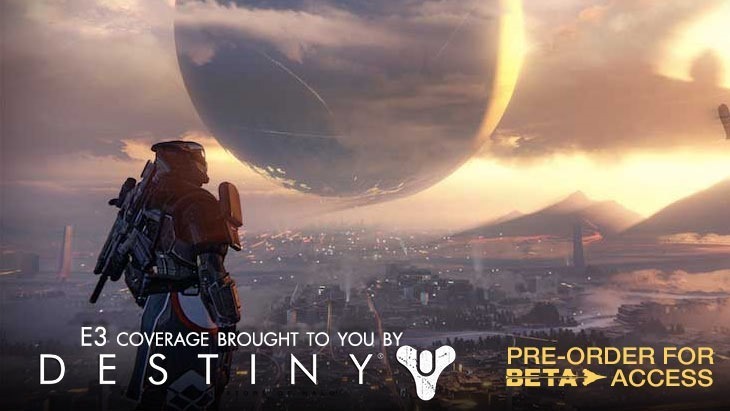 If you want to secure access to the beta, you’re going to have to pre-order the game from a participating retailer.